The co-author of Becoming Steve Jobs punctures a few popular misunderstandings about the Apple genius. What made you decide to write Becoming Steve Jobs? Having written about Steve Jobs for 25 years, I felt I had had a front row seat to observe his development as a business leader. It was a fascinating evolution to witness. We hoped to appeal to a broad audience of people who might be interested in the 'hows' and 'whys' of Steve’s remarkable success by the end of his career, especially considering the reputation he had developed as a temperamental and tyrannical leader. He could be that way, but there were many other dimensions to his personality and management style, and they grew and shifted as he matured. You first interviewed Jobs in April 1986. What was your first impression of him? You made your own career writing about Jobs for Fortune. Tell us about your relationship with him. First and foremost it was the traditional source/reporter relationship, and was transactional in that sense. He wanted a certain type of coverage from me, and I wanted a certain kind of exclusive access to tell my stories. Over the years, when you interact with a person for hours at a time with some frequency, you begin to know each other as people. We were nearly the same age, and shared a lot of common interests and formative experiences and so we were 'sympatico' in many ways. Some of my stories would anger him, but others would surprise him with their reach. 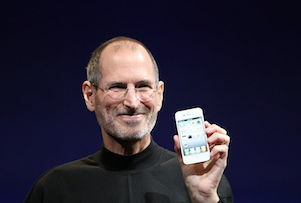 You talk about Jobs' so-called 'wilderness years' - from his 1985 ousting from Apple to his cautious return in 1996. Why was this period crucial to Jobs' development as a leader? Steve needed time to grow up as a manager. He also needed to stumble and scuff his knees and learn to recognise his fallibilities. That didn’t happen in a very useful way during his first tenure at Apple because it became such a huge success so quickly. Neither NeXT nor Pixar were overnight successes and instead were the product of perseverance and dedication, which he learned was just as important as genius and technological brilliance. You say posthumous coverage reflects 'stagnant stereotypes'. What, in your view, are the three biggest myths about Jobs? 1. That he was a mean-spirited person. He wasn’t. He was simply impatient and a perfectionist and didn’t suffer fools with any grace. 2. That he was a control-freak. He was actually very good at delegating decision-making authority. 3. That he was a techno-genius. Steve didn’t really know that much about digital technology. He was an impresario, who knew how to marshall resources to build beautiful products. Tell us one thing we didn’t know about Jobs? What can other business leaders learn from Jobs’ comeback at Apple? If there is a formula to Steve’s success, it is that he hired extremely talented people and had them work in small teams on very specific projects, and then gave them a lot of latitude to make decisions. He was a strong believer in individual accountability and would not abide excuses for poor performance. But he also made it very clear what he expected. Most people who worked for him rose to the occasion, until they ran out of gas. What do you think Jobs would say about your book? I’m sure he would have some quibbles with it. He was a perfectionist, after all.